Review Hey, tablet geeks out there, do you remember what you hated most about Samsung’s original 7in Galaxy Tab? The grainy display, the glitchy software, the lack of memory, the poorly located buttons that you kept pressing by mistake? 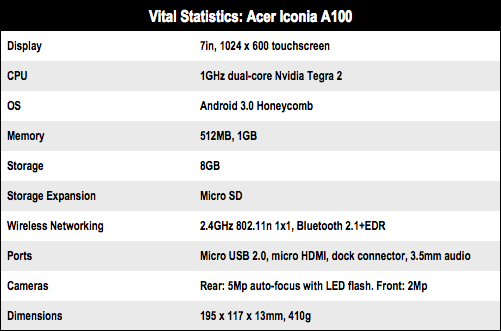 I suspect Acer drew up the same list because its Iconia Tab A100 is essentially what the 7in Galaxy Tab isn’t. Not everything has been dealt with – the A100 is actually thicker and weighs more than the Galaxy Tab, Doh! 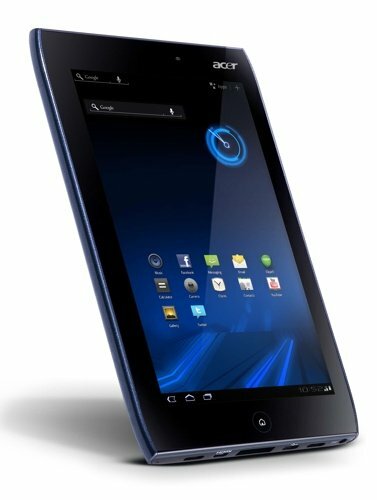 – but Acer has done enough to change my previously low opinion of 7in tablets. To be clear: I found the A100 to be extremely usable on the move, much more so than any 10in tablet. There’s something special about being able to slip it in and out of a coat pocket whenever I like rather than rummaging for "my proper tablet" in my man-bag. If 10in is Steve Jobs’ sweet spot for work-and-fun tablets, I'm coming to the opinion that 7in is the sweet spot for computing on the hoof. If I want to check my social media, play a game, dash off an email, read a book or research a topic, reaching into my pocket for an A100 wins hands down against the fiddliness of a diddy little smartphone or the two-handed, sit-down effort required by a 10in tablet. My personal list of must-have features on a tablet include USB and HDMI connectivity through non-proprietary adapter cables, an SD card slot, and a quality main camera with video recording. The Iconia Tab A100 ticks all these, throwing in GPS and 1GB Ram for good measure, although I’m not sure about the value of stereo speakers when they’re only a few centimetres apart. And, BTW, there are some similarly priced models out there with only 512MB of Ram, so check before you buy.